A desiccant air dryer is the most cost-effective method of drying compressed air for applications which utilize gases that have an exceedingly low dew point. Most compressors use a refrigerated air dryer, which simply cools down air and removes the water droplets that formulate. A desiccant air dryer uses a chemical compound, activated alumina or silica gel, rather than refrigerant to capture moisture from the air, which is why it can be used to take moisture out of gas that isn’t easily cooled to its dew point, which puts a strain on the common refrigerated dryer. 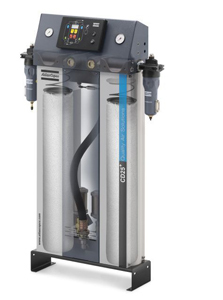 For companies that need desiccant air dryers to achieve the air output required for the success of their operations, A&W Compressor has the compressed air dryer selection to suit your compressors of virtually any kind. As your comprehensive source for all of your compressed air needs, we carry refrigerated and membrane dryers as well. Our experienced team has been in the compressor business for nearly 30 years, so you can trust us to find the right air dryer for your machine at a price you can afford. Call or e-mail A & W Compressor today to learn more about a desiccant air dryer and whether this dryer is the right type for your compressor in Maynardville, Franklin, Mountain City, Dickson, and throughout TN.